If it is tranquillity you are seeking in your quest for an ideal French property, then look no further than the little village of Jugon, in north-eastern Brittany. The town has long understood the importance of water, having once built its defences by controlling the rivers and streams which run through and beside the village. It now uses this most beautiful of natural resources to generate an income from the leisure and tourism industries, to breathe new life into some of France's rural villages and communities. Jugon is frequently referred to as Jugon-les-Lacs, due to its beautiful lakes. The town is crossed by two rivers, the River Rosette, formerly called the Jugon, and the two branches of the River Arguenon. There are two lakes, the north lake, the Lac de l'Arguenon, and the south lake, the Lac de Jugon. The lakes are perfect for many leisure activities, and also impart a tranquil air to the village as only water can. The rivers are still considered important to the town and are frequently decorated with floral arrangements. The town has its fair share of traditions and history, and there are a good many historical buildings to see. One such building was once a staging inn from the Middle Ages. Also worth a look are the town hall and the church, which has some very special stained glass windows. No, it isn't a French word... well, not one you'll find in the dictionary anyway, but it is the word that the people of Jugon have given to the series of events that are held in and around the town. The word is an amalgamation of the French word fête (meaning a festival or celebration) and the word lac (meaning lake). These are tremendous fun and really worth attending, and range from free concerts and barbecues in the town square, to arts and crafts fairs. Jugon also has a lovely Christmas market, complete with festive log cabins, so there is plenty to do whatever the time of year! In fact, some people say that Autumn is the best time of year in Jugon, as you can enjoy the traditional pursuits of mushroom hunting and cider making... well, of cider drinking anyway! Jugon is the perfect place for you if you are either a keen fisherman or a devoted cyclist. For fisherman, the Maison de la Pèche is a treasure trove of information about your sport, with fishing courses on offer and also organised day trips, nature walks and other activities. Cyclists too will love Jugon as the town is fast developing into a centre for off road cycling, and has superb signposted tracks and trails and also cycle hire. Other sports are available locally too, including golf, horse-riding and tennis, which are easily accessed from Jugon. Should you wish to explore the area outside the town (and why not indeed?) then you will find yourself spoiled for choice. Jugon is close to St Malo, to the Brittany coast and to the lovely mediaeval town of Dinan, perhaps one of the most beautiful towns in France. If you wish to travel by air, you have the choice of Dinard, served by Ryanair and Aurigny, or Rennes, which has flights with flybe and Aer Lingus. Ferry travel is another good choice, as the port of St Malo is very close at hand, being only 40 minutes away, and the ports of Ouistreham (Caen) and Cherbourg are also within a very reasonable distance. 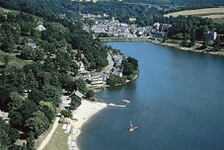 If you are travelling by car, you will find Jugon-les-Lacs off the N176 between Dinan and St Brieuc. Property in this area tends to be quite expensive, and this has a lot to do with the accessibility from the UK. As Jugon is popular with tourists, however, you may find that renting out your property when you are not using it will make a property purchase here worth while. Do you know Jugon-les-Lacs better than we do? Do you have photos of Jugon-les-Lacs? Jugon is found in the north-west of France, in the east of the Côtes-d'Armor department. Access: By air: Fly to Dinard or to Rennes. By boat: The port of St Malo is the closest, and there is also easy access to the ports of Ouistreham (Caen) and Cherbourg. By car: The town lies off the N176 between Dinan and St Brieuc. Economy: The economy revolves around the tourism and leisure income generated by the lakes. Interesting fact: Jugon is a town defined by water. Its defences, historically, revolved around control of the rivers and streams, and nowadays the economy is dependant on the lakes.